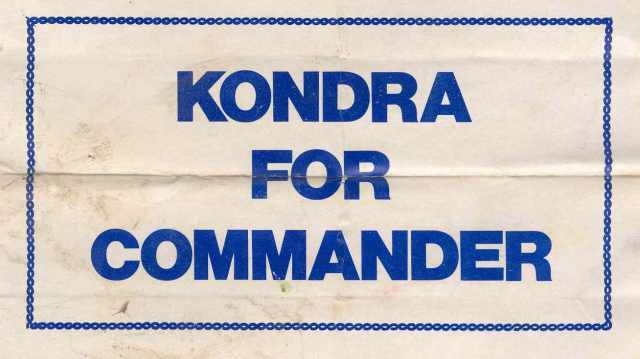 Those of you who flew the MAC "system" in the late seventies may have noticed "Kondra for Commander" bumper stickers throughout the world, and wondered what they were. Now that almost thirty years have passed, and any statute of limitations has expired, it can be explained. The 8th MAS at McChord had a vacancy at squadron commander. We had an officer in our squadron who was very well-liked and respected by all...Lt Col Vernon Kondra. We felt that a little name recognition wouldn't hurt, so we had the stickers printed up. Our crews then traveled the world "distributing" the stickers. I know they showed up at locations such as on crew busses at Yokota, power units in Singapore, and ski lifts in Washington state, just to name a few. Did we help or hurt his career? We'll never know for sure, but Lt Col Kondra became our squadron commander. He later became Lieutenant General Kondra, commander of MAC's 21st Air Force. I was an aircraft commander in the 8th under his command. I've never had a better boss, before or since.